NEW YORK CITY — New Yorkers took to the polls Tuesday to cast their votes in a handful of hotly contested Congressional primaries that could redefine the city's political landscape. In upper Manhattan’s 13th Congressional district, one of the country's most competitive and closely watched Democratic primaries pits four-decade incumbent Rep. Charlie Rangel against upstart state Sen. Adriano Espaillat in a district that was recently redrawn to include a majority Latino population. Rangel arrived at the polls Tuesday morning in a dark suit, white shirt and red tie with stripes. Outside, about 20 supporters cheered loudly for him, holding up signs, chanting "Charlie, Charlie," and "Fired Up, Ready to Vote." Brooklyn Councilman Charles Barron (at podium) is vying for a seat in the U.S. House of Representatives. After voting, Rangel, 82, immediately dismissed any questions regarding his age and tenure by asserting that he remains the best man for the job. "Like any other job, whether I’ve had it for four months, four years or 40 years, I believe I’m the person who can best pick up the time that we need to move forward from where we used to be," he said, after casting his vote at P.S. 175 in Harlem. "Not one of [the other candidates] has ever indicated that they can do the job better," he said, adding, “If I lose tonight, I will sleep just like a baby, and cry myself to sleep." Espaillat, who cast his vote at P.S. 98 in Inwood, said he expected "a big victory" over Rangel and urged those in the district to "vote for change." "I think we're going to have a bigger turnout than we expected," he said, despite predictions of dismal voter participation in the rare June primary. "People are very enthusiastic about this election." Espaillat outlined his platform, which includes an emphasis on immigration reform in Congress, debt relief for student loans, job creation and an increased minimum wage. Some voters Uptown said Rangel's recent ethics scandal tipped the scales in favor of Espaillat. "Rangel got himself in a lot of trouble, and I don't admire him for that," said Leslie Zema, 64, a retired teacher from the neighborhood, who also noted Espaillat's strong record of service in upper Manhattan. "Rangel's ethics problems did him in for me." Retired AT&T employee Valarie O'Hara, 63, also voted for Espaillat. "I'm not happy with the controversy surrounding Rangel these days," she said. "[Espaillat] knows the neighborhood. He's from here. He's our local guy." 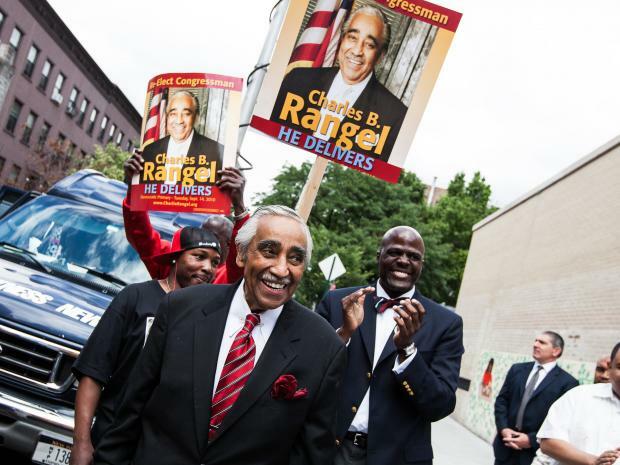 Still, other voters said Rangel's many decades in Washington, D.C., made him the most equipped for the job. "He just seemed like the right choice at the time to keep the momentum going," said Nancy P., 60, who declined to give her last name. "He's very bright, very sharp. Granted, he's also old." In Brooklyn’s 8th Congressional district, outspoken Councilman Charles Barron makes his bid against party darling Assemblyman Hakeem Jeffries in the heavily African-American district. Jeffries, joined by his two sons, arrived at P.S. 9 in Prospect Heights to cast his vote and expressed confidence that he's "identified thousands of supporters who are going to come out today." "We'll stay in Brooklyn [if I win], but I promised [my son] I'd take him to the White House," he said. "We're going to celebrate tonight, then the people's business begins tomorrow." Ede Fox, chairman of Brooklyn Community Board 8's Environment/Sanitation Committee and a City Council candidate, stood with a group of Jeffries supporters outside the school. "I've been impressed watching him in the Assembly," he said. "We need to start cultivating a younger crop of Congress members who can develop a career and move up within the Democratic Party." While many openly expressed support for Jeffries, at least one voter found fault with the redistricting process that left her in the dark when she came out to pull the lever. "I've been living in this neighborhood for 50 years and they've slowly, but surely gerrymandered us to death," said Betty Welch, 74, of Prospect Heights, who wasn't aware the district had been redrawn and therefore couldn't vote for Jeffries. "It's frustrating. I don't deal with change well." Barron, meanwhile, said he was confident he would pull out a win. Barron spent the day in East New York visiting polling stations and also found time to speak to the 8th grade graduates of George Gershwin Junior High School with his wife, Inez, where the two later rapped some words of wisdom to the students while the marching band played behind them. Congresswoman Nydia Velazquez (left) is seeking an 11th term in the U.S. House of Representatives. "He told us to stay in school and take our education seriously," said student Jahlaisia Smith, 19, who said was inspired by his speech. "He also told the boys to always respect women when they grow up." 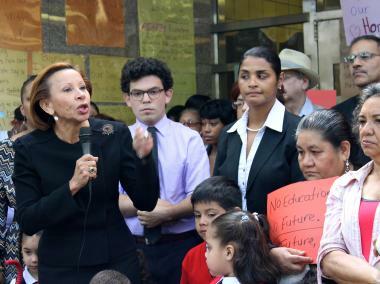 Rep. Nydia Velazquez, riding endorsements from a host of high-profile Democratic pols, will vie for an 11th term in Congress against City Councilman Erik Martin Dilan in the 7th Congressional district, which covers parts of Brooklyn, Queens and lower Manhattan. Velazquez spent the day greeting voters across the district, joined by fellow pols. In Queens’ 6th Congressional district, the packed field features Democratic challenges from Flushing Assemblywoman Grace Meng, Assemblyman Rory Lancman and City Councilwoman Elizabeth Crowley in one of the most ethnically diverse districts on the ballot. "We're very excited to cast our vote," Meng said outside of the St. Andrew Avellino School in Flushing Tuesday morning, after casting her vote with her husband and two young sons. "We look forward to [a] good result tonight, and we look forward to winning in November and getting right to work." Meng said she visited a few polling stations and was "pleasantly surprised, as every polling station we've seen a few people that said that they voted for me." In Flushing, Taiwanese-born Grace Meng seemed to enjoy strong support in the Asian community. "We need the power for the Asians and she represented our voice," said Aesun Choi, 55, after voting at St. Andrew Avellino School off Northern Boulevard. "She has been doing good the last four years. She's young and has a great future ahead," she said. Eunsook Cho, who is Korean, said she decided to vote for the first time in her 14 years living in the United States because Meng was on the ballot. "She represented the Asian and she's a woman," said Cho, 54. "I care about everything: the economy, healthcare and education. I believe she can work to the community's interests." Crowley, joined by her two sons, went to P.S. 113 in Glendale Tuesday morning to vote and said early indications showed turnout would be better than expected. "We just left the train stop from Forest Hills, and there were lots of people who said they already voted," Crowley said. "So it's up to the people now. It's in their hands." She added that a strong campaign will hopefully propel her to victory over the other candidates. "I think I outworked my opponents," Crowley said. Voters can find their designated polling places at the city Board of Elections website, and report any problems to poll workers there or by calling their borough offices.